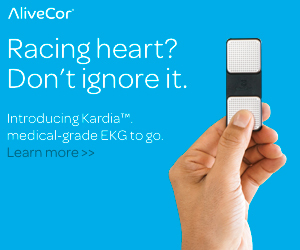 Taking an EKG is easy with KardiaMobile from AliveCor. Over the last several years there has been an emergence of wearable devices and other at home technology aimed at monitoring people’s health. This includes the development of smart watches and activity sensors such as Fitbit and Apple Watch. With over 5 million Americans being diagnosed with atrial fibrillation, it’s no surprise many companies have started to offer at home monitoring for atrial fibrillation. These devices provide a unique opportunity for patients to monitor their AFib together with their doctor. Of the devices currently on the market, the most popular is the KardiaMobile and the KardiaBand, which are both made by AliveCor. So what are these products and how can they be helpful for someone with atrial fibrillation? Both products can be purchased for at home use and they do not require a prescription. When you purchase your own device it’s yours to keep along with all of the data recorded. The Kardia devices work similar to external monitors given to you by your doctor, like the 24 hour Holter Monitor or the 30 day Event Monitor, but they don’t have to be returned. The Kardia devices have a built in algorithm for detecting AFib. When used properly, clinical data supports a 95% accuracy. The biggest difference between a Kardia and a simple heart rate tracker, such as on a FitBit, is that it actually takes an ECG, a picture of your heartbeat. This is very similar to the ECG you receive from your doctor’s office, just a simplified single lead version. The Kardia uses the ECG to identify if someone is in atrial fibrillation. Within a few seconds, the device can then send you an automated response to let you know if your rhythm is normal or if you’re in atrial fibrillation. The images or strips that the device records belong to you. If you chose you can send a copy of the images to your doctor’s office for further review. As I mentioned earlier, one of the best features of these products is that they are yours to keep after purchase. I have frequently discussed that AFib is a chronic condition that requires long-term management. When it comes to a 24-hour or 30 day external heart monitors, doctors only know what is happening in your heart while you are wearing the monitor. If you have symptoms the next day or the next week, then your doctor cannot be certain what is causing your symptoms. There are 2 products currently made by Alivecor- the KardiaMobile and the KardiaBand. In the KardiaMobile, you get an accessory that is about 3 inches long. This is small enough to easily carry in your pocket or even attach to the back of your smart phone. On this accessory there is a place to put your fingers if you feel symptoms. The accessory then transmits to the Kardia App on your smart phone to give you results of your ECG, which usually takes about 30 seconds. The KardiaBand works the same as the KardiaMobile but instead it is an attachment that goes on an Apple Watch. On the KardiaBand the ECG sensors are on the band itself and transmits the ECG directly to the Apple watch. The KardiaBand can also use the heart rate tracker already on the Apple watch to allow for earlier detection of AFib, but this particular feature requires a subscription. So which do I usually recommend to my patients? I typically recommend the KardiaMobile. My patients find it easy to use and the device provides good quality ECG’s; good enough that my office can determine the rhythm when sent a copy of the ECG. In my opinion, the KardiaBand only makes sense if you already own the Apple Watch. What tips can I give on getting the best results from the Kardia devices? Have you ever had an ECG done at your doctor’s office and they tell you to be still or even hold your breath while the test is being performed? This is because even very small subtle movements, such as breathing, can interfere with the quality of the ECG. With the KardiaMobile, you will likely get the best quality ECG by resting the sensor on a stationary object, like a table, and then put your fingers on it. Don’t hold the device in your hands. You would be surprised at how much your hands move even when you are trying to hold still. With the KardiaBand, you typically have to press your arm against your body or on a table, again the purpose of this is to stop the small subtle movements and create a good quality ECG. Are there times when the Kardia devices may be inaccurate? I am overall in agreement that the Kardia devices have a very high accuracy in detecting AFib when used properly and when a clean ECG strip is obtained. But what about other types of irregular heart rhythms? AFib is not the only abnormal heart rhythm that causes palpitations, even though it is the most common. I have seen a few causes where a patient feels palpitations and uses a Kardia device and gets an unclassified response, this is usually because the patient is in an abnormal rhythm, it’s just not AFib. Patients may get an irregular heart rate or palpitations from extra beats from either the top chamber or lower chamber of the heart, called PACs and PVCs respectively. Another arrhythmia where the algorithm may miss the diagnosis is atrial flutter. Atrial flutter is very similar to AFib but is slightly different. Atrial flutter can make your heart beat fast and irregular too, just like AFib, however in atrial flutter the heart rate may be less irregular. It may stay consistently at 120 without stopping. In a case like this the algorithm from the Kardia may also give an unclassified interpretation. This is where your doctor comes in. Even if the algorithm on the device gives you an unclear or unclassified message, if you are having symptoms, share the ECG images with your doctor. Only your doctor can be certain if there is an abnormal heart rhythm. There is also a subscription service available to those with a Kardia product, which goes for $9.99 per month, or also $99 per year. In the subscription service, you get unlimited cloud storage of ECGs, a customized monthly report mailed to your home, medication tracking, and also the smart rhythm monitoring which is the early detection feature on the KardiaBand. But don’t let this be a deterrent if the subscription cost is too high. There are a lot of great features on the free app such as instant ECG analysis and unlimited email recordings of your strips. Overall, I feel that both the KardiaMobile and KardiaBand are great products for at home monitoring of a patient’s AFib. As I stated above, because AFib is a long-term condition, it is great for patients to have something at home to track their symptoms long-term. Any limitations of the current Kardia algorithm can be cleared up by having your doctor review the ECG strips obtained by the device. As many of you may have heard, the Apple Watch will soon be offering similar features. But a new Apple Watch starts at $399. Both the KardiaMobile and KardiaBand sell for $99, which is yet another reason I typically recommend these products to my patients. Though both the Apple and Kardia products are FDA cleared, the Kardia devices have been around longer and have more data to demonstrate accuracy. If you are interested in the Kardia products, check out the below links for further details and to purchase through Alivecor®. Please note that I believe in these products whole-heartedly and receive a small affiliate compensation for devices purchased through this link at no additional cost to you. For further information on affiliate partners click here. Newer PostDoes Magnesium Help With Atrial Fibrillation?